Guitar For The Soul NEW! "From 1995 through 2007 I traveled all across America teaching my weekend Praise Guitar Workshops and playing concerts in churches. Ever since then I’ve always had the intention of developing and recording some really great arrangements of hymns for the guitar. 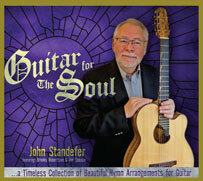 I am happy to say that at last I am now releasing Guitar for the Soul, which contains a beautiful array of hymns that come from diverse origins over centuries of time. I’ve endeavored to make this CD colorful and technically interesting while still being warm and sweet for times of reflection, prayer and meditation. I’m very happy with the outcome and am anxious to share it with you." "I hope you will look the album over, check out the extensive song list and consider ordering a copy today. Better yet, perhaps you might want to pick up multiple copies as gifts for friends and family. I have set up a special offer at my website in order for you to get quantity discounts." There are lots of rich moments, duets and other surprises throughout the 21 hymns recorded in this collection. The audio samples below are just a small taste. John has also published a YouTube video where he talks more about the making of this CD. Click here to view the YouTube video.